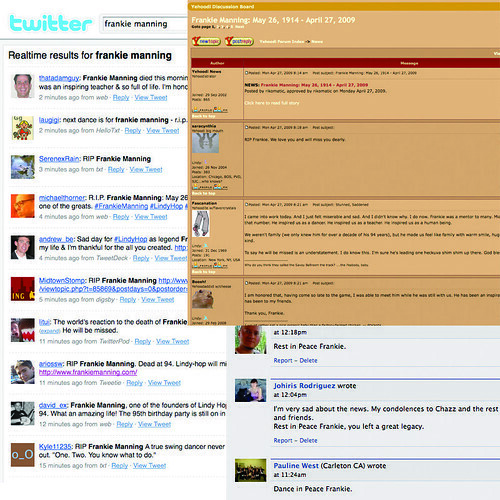 As news about Frankie Manning's passing spreads around the world today, I witnessed an explosion of surprise, grief, and tearful remembrance live on the internet. It was like being surrounded by the voices of hundreds and hundreds of Frankie's friends and fans from around the globe in a collective, ever-changing memorial. Yehoodi discussion "Frankie Manning: May 26, 1914-April 27, 2009"
Feel free to add other links to online forums, blog posts and other online tributes in the comments section. This is probably the first time that I’ve actually felt like I was missing something because I’m not on Facebook or Twitter. wow, that’s really saying something! Soon after Frankie passed on, I checked to see what others were writing. At first, there was little mention in the mainstream press, which made me sad. But seeing how many other people were so touched by Frankie (via Twitter, blogs, friendfeed, etc. )… that made me smile again.